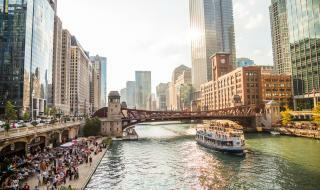 An outdoor wine garden, fishing, kayaking and more — get to know the Chicago Riverwalk. 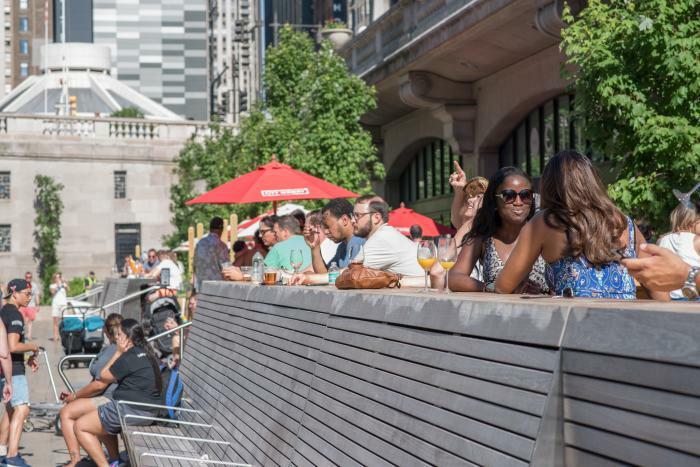 Eat, drink, play and explore a waterside wine patio, pier fishing, kayaking and more along the Riverwalk’s lush 1.25-mile pedestrian stretch, which runs along the south bank of the Chicago River from Lake Shore Drive to Lake Street. 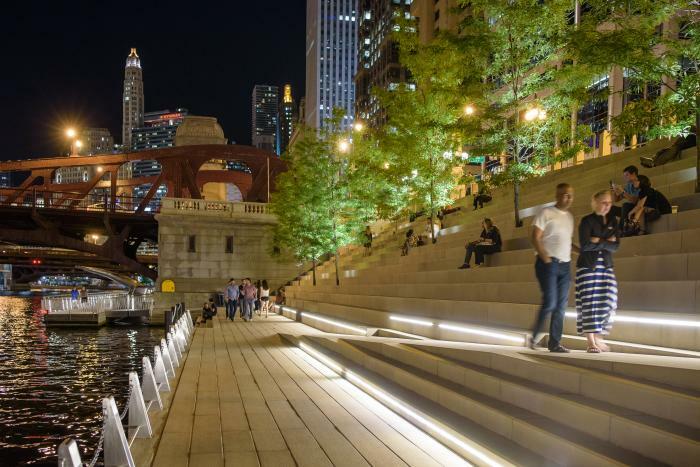 Here’s the lay of the land of the Chicago Riverwalk, and things to know before you go. 1. It’s made up of six coves or "rooms"
The Marina Plaza connects the Vietnam Veterans Memorial and its new Riverwalk additions to the west. Here, docking boaters and strollers find a bevy of restaurants, as well as great seats from which to enjoy views of the Chicago River. Stop for a snack or rent a kayak right along the waterfront. This urban oasis, with trees growing from the steps, provides shade and a unique respite for city explorers. This sunny cove is great for families. Adults can relax around a fountain while the little ones romp in its jubilant sprays. The Jetty provides an educational component, where visitors can observe fish and learn about river ecology. 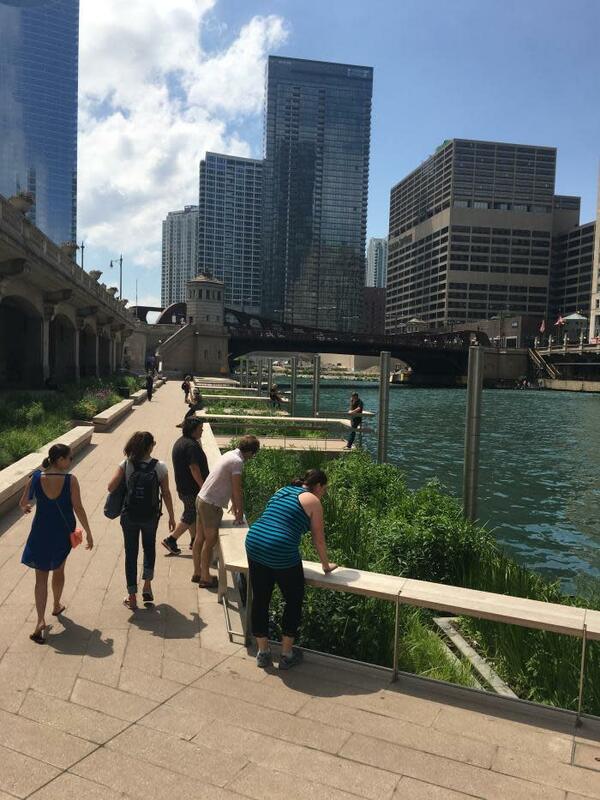 Surrounded by floating gardens, The Riverbank provides stunning views of the confluence of the three branches of the Chicago River. It’s ideal for a midday break or a romantic date night stroll. 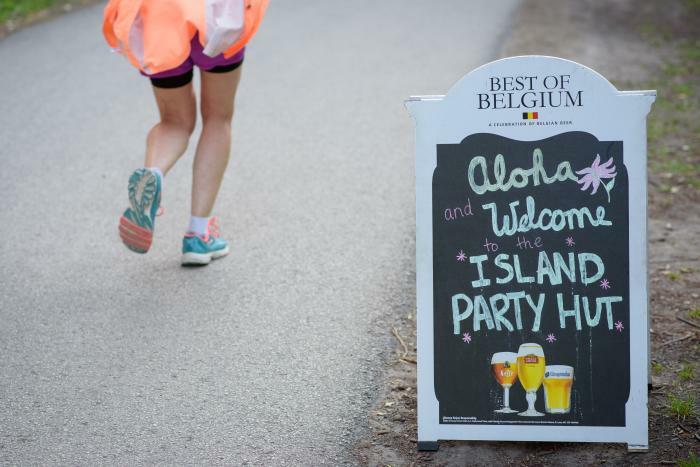 Hit the Island Party Hut Tiki Bar for live island music, grilled grub, and refreshing rum and margarita concoctions. Book a charter on an Island Party Boat and chill on the upper deck, or whoosh down the water slide for a swim in the lake. The Riverwalk is a hands-on recreational experience. Call on Urban Kayaks for Chicago River kayak tours and rentals. Boat on a Chicago Water Taxi as you take in the sights. 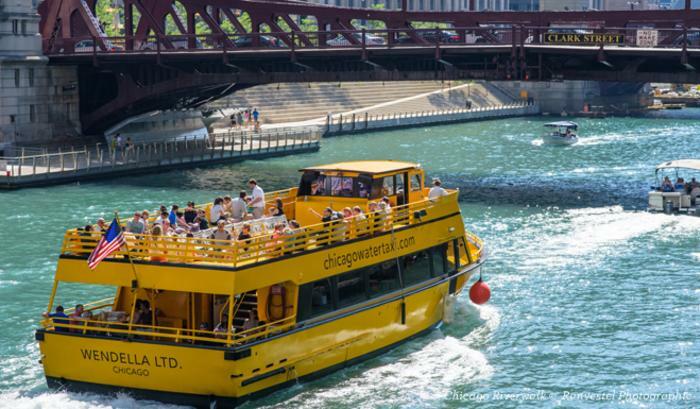 Book an outing with family-owned Wendella Sightseeing for Chicago’s Original Architecture Tour or join the Chicago Architecture Foundation Center River Cruise aboard Chicago’s First Lady Cruises to hear the stories behind the city’s most iconic buildings. Or enjoy panoramic views while you dine on Odyssey &apos;s Chicago River Dinner Cruises. City Winery Chicago at the Riverwalk is a fabulous place, with six house-made wines on tap and an outdoor wine patio. Tiny Hatt is a barbecue-focused Riverwalk dining hot spot, offering free live music on select evenings. Lillie’s Park Grill serves grab-and-go goodies for hand-holders to enjoy along benches in The Cove and River Theater sections of the Riverwalk. And Dulce in Horto sells cupcakes, cookies and brownies from a roaming cart, so you can always indulge your sweet tooth. Visit the educational Jetty area to learn about the river’s system of canals and fascinating feats of engineering. Or head to the fishing pier and cast a line (make sure you get your fishing license first!). Bird-watchers should keep an eye out for mallards, ring-billed and herring gulls, rock pigeons, American robins and European starlings that swoop among the skyscrapers. Check out the calendar of events for scheduled bird walks and more. Public art is on show throughout the pedestrian trail. In addition to the glorious views of architecturally significant skyscrapers which create an urban canyon along the Main Branch of the Chicago River, the City displays various works of public art, including: Riverwalk Gateway by Ellen Lanyon is located beneath the Lake Shore Drive Bridge; 10-foot cast aluminum Allium by Carolyn Otters is located between Columbus Drive and Lake Shore Drive; Sam Kirk’s Vejigante, Mask On, a single panel graffiti work located along the Riverwalk between Franklin Street and Lake Street; and Ballerinas, a four-panel work recently completed by Tyrue “Slang” Jones, and located between Franklin Street and Lake Street. 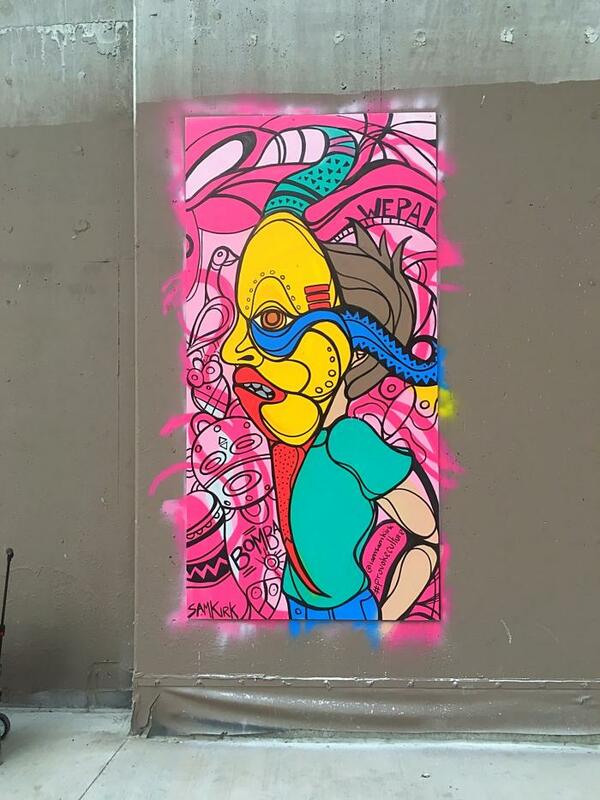 In addition there are several works of public art being installed along the Riverwalk from June to October. The city has been developing the plan for the Riverwalk since the 1990s. The river itself has a long history that is tied directly to the development of Chicago. 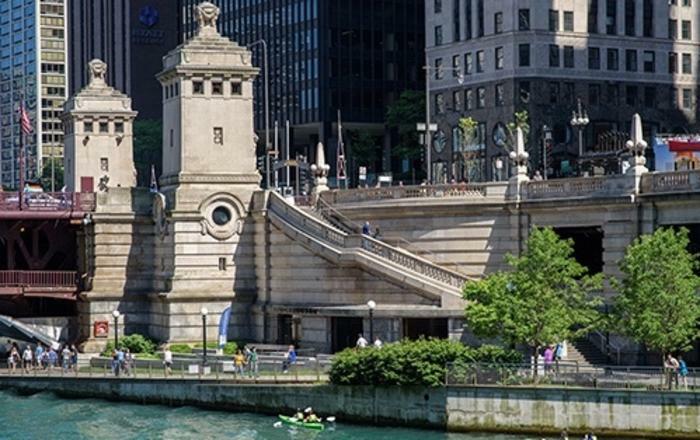 Stop in to the fascinating McCormick Bridgehouse & Chicago River Museum for a celebration of the river’s famed movable bridges, and be treated to a panoramic view of the city.